If a couple is living a happy and contended married life, then nothing could be more blissful for them in this entire world. To make a married life idyllic it is important for the couple to make 6 promises that make a marriage. At the time of getting married, making promises, just for the sake of considering it a requirement, is not something that could work. A couple should consider each promise made, lifeblood for a happy married long life. 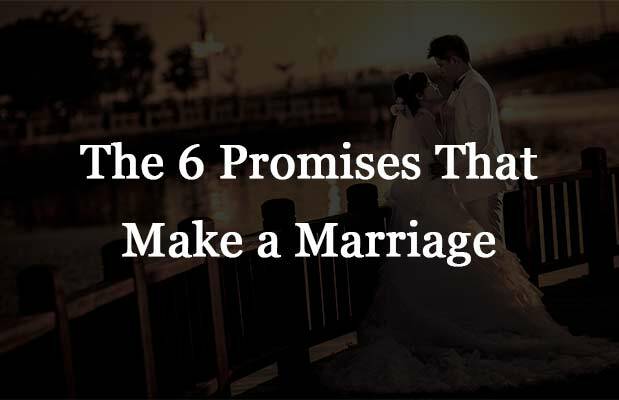 Today you will know about those promises that make a marriage. They are not only for those, who are going to get married, but also for all those couples, who have got married years back. The first promise that a husband and wife make to one another is to love and cherish each other all through their lives. Loving one another is not only restricted to loving physically or just at the beginning of marriage. It’s a lifelong promise for being with each other in every type of situation. Loving purely is something that keeps husband and wife in love bond even when they are at their worst. Being together with each other in every circumstance is the second promise that worth. No matter what the life brings, husband and wife stays committed to face every challenge together. Promising to be together in health and sickness is yet another essence of a happy married life. Giving no value to any kind of health issue and loving as strongly as ever. It is not always necessary that both husband and wife feel good in health. In case any of the two is getting weaker, the other has to act strong and give strength to the spouse. Financial crises have been one of the biggest and common reasons of separation and divorce across the globe. But, if a couple makes a promise by heart for being together even if financial crises comes in their life, then they could be more comfortable and strong enough to face this challenge. In short, a couple must never benchmark monetary things for loving each other. Making promise to each other for not letting anybody else come in between them is yet another key to a happy and successful married life. Husband and wife should forsake any other person who could come in their heart and mind. Husband and wife should promise that the knot of their marriage is the tightest one and only death could apart them. There is not going to be anyway to take decision of leaving each other for any reason.